Hello! After taking a week off, I’m back to writing. I have to admit that the Standard format hasn’t felt very exciting to me recently – not that it’s bad necessarily, but it looked for a while like the format was solved… The best decks have been figured out, and there’s been little innovation in the lists. Preparing for the European International Championship was less a matter of finding some clever way to beat the metagame, and more one of practicing a few top tier decks and choosing one at the last minute based on the expected metagame. No Zoroark-GX? Let’s play Zapdos / Jirachi. Lots of Zoroark? Blacephalon-GX / Naganadel is a better play. However, the results of Denver Regionals have shown that there are still surprises left in this format. Caleb Gedemer won the event with Zoroark-GX / Control, something that has always existed in the format but hasn’t had a lot of attention. Celebi and Venusaur-GX made Top 4, and a Turbo variant of Pikachu and Zekrom-GX, featuring Order Pad, made Top 8. 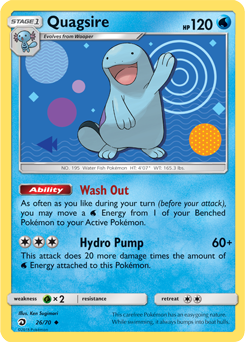 Ross Cawthon piloted Naganadel / Quagsire to a Top 16 spot, and a few players even brought Beast Box – Beast Box! – back from the dead. So what happened? I have a simple explanation for many of the above surprises: Malamar disappeared. As a popular and reliable deck, Malamar once played the role of a gatekeeper, stopping some of the most eccentric decks in the format from having a shot at winning. However, as it takes bad or even matchups against the best decks in the format, Malamar has underperformed since the beginning of the Team Up format, especially as the best decks (Lightning variants and Zoroark-GX variants) kept being refined and perfected. Logically, less and less people played Malamar since it didn’t do well, and finally, we’ve reached a point where it’s possible to abuse Malamar’s absence, which means that decks that didn’t have a good shot before can finally make Top 8 or higher. That’s the short version, at least. Since analyzing and understanding these kinds of shifts in the metagame fascinates me – and, more importantly, has been integral to me becoming a better player – I’ll elaborate on this theory, explaining exactly what it is about Malamar that made it play such a role in the format. I also want to talk about some specific decks that have benefitted from Malamar’s decline. Finally, I want to touch on an important question: can Malamar come back? Let’s think back to the release of Team Up. Malamar / Ultra Necrozma-GX was one of the most hyped decks of the new format thanks to Viridian Forest. 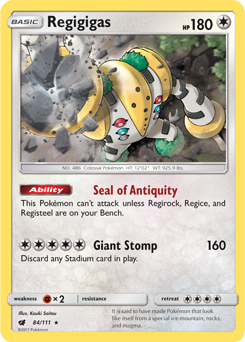 The deck finally gained a dedicated Stadium that gave it a way to find Metal Energy when needed (something that it had sorely lacked), and Jirachi and Erika's Hospitality gave it a consistency boost. The deck had been performing very well in Japan, so there was proof of its efficiency. The deck was quickly adopted by many players and initially did pretty decently. What makes Malamar popular is its adaptability. I’m not talking about the deck building process here – although there are definitely variable techs people could include, such as Dawn Wings Necrozma-GX and Gengar and Mimikyu-GX – but about the gameplay itself. You can use Ultra Necrozma-GX to take big Knock Outs with Photon Geyser, or you can attack with Giratina and get it back whenever it’s Knocked Out. Sure, that’s only two options, but they cover most of the matchups. To keep it simple, against GX decks, Ultra Necrozma-GX is great because its damage output is unlimited; against non-GX decks, Giratina wins the Prize trade, especially since you don’t need Rescue Stretcher to get it back, making the deck run more smoothly than the opponent’s. Even non-GX attackers with too much HP for Shadow Impact, such as Alolan Exeggutor, are not an issue, thanks to Distortion Door adding damage to the field, and Sky-Scorching Light which can take multiple KOs in the late game on smaller Pokemon like Exeggcute, Marshadow, Shuckle, and so on. Malamar didn’t beat everything, but the power and simplicity of its two possible game plans were such that most rogue decks couldn’t keep up. Malamar simply did what they did… but better. Charizard is a good example. Like Giratina, Charizard can easily deal 130 damage, simply by attaching two Energy with its Ability. It also has (effectively) 130 HP, since it deals 20 damage to itself by using its Ability. Like Ultra Necrozma-GX, Charizard can also deal more damage if needed, in order to KO a bigger foe. Charizard needs more time to attach additional Energy, but unlike Ultra Necrozma-GX, it only gives up one Prize. One could imagine how, in a different format, Charizard could have been strong. A Pokemon that accelerates Energy to itself with an Ability, deals enough damage to KO most non-GX Pokemon, and can even OHKO Pokemon-GX (even Tag Teams!) with more investment? That’s a recipe for success. However, Charizard has huge issues against Malamar itself. 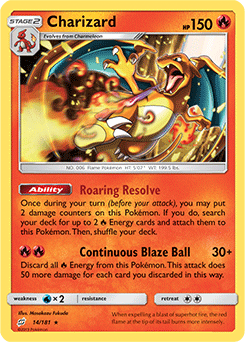 The Malamar deck can simply use Giratina and take a KO every turn against Charizard. With Giratina coming back from the Discard, if it takes the first Prize, it will never give up the Prize lead. Even if Charizard takes a KO first, it can run out of steam at some point, something that won’t happen to Malamar. And in the worst case scenario, Sky-Scorching Light GX can allow the Malamar player to come back from a prize deficit by taking multiple prizes on Charmander or Jirachi. Put simply, against a Malamar player that knows what they’re doing, it’s almost impossible for Charizard to win. And with so much Malamar at every tournament, it’s a huge risk to run Charizard. Here’s another example, although I don’t think it illustrates my point as perfectly as Charizard does, but might be convincing to more people. Remember Lost March? It wasn’t so long ago that the deck was popular, both with the player base in general and with (at least some) top players. It even got hype (and the adorable nickname of Nuzzle March) when Emolga was released in Team Up. It was a non-GX deck that could stand up to Pikachu & Zekrom-GX! Yet Lost March has seen very little play, and no success, since then. Sure, Zapdos was an issue, and the PikaRom matchup was not as positive as expected, but I think the main reason why the deck has been forgotten is its Malamar autoloss, due to Sky-Scorching Light GX destroying the whole deck. Despite some good matchups across the field, Lost March has been kept out of the format. It should be pointed out that Malamar’s strength isn’t enough to make it a gatekeeper; its popularity is just as important. Of course, the two are correlated, but there’s a difference. Stall decks, for example, are definitely strong — stronger than Malamar, if you look at the results of the many SUM-TEU major events — but, unlike Malamar, they are unpopular by nature, so they can never act as a gatekeeper. Again, this is not due to either deck’s strength; it’s just that many people are turned off by Stall’s slow playstyle, having to take the clock into account, or simply the difficulty of facing the many anti-stall techs that can be ran, whereas Malamar is a much simpler concept, which many players, beginners and experts alike, find fun. Players will refrain from playing Lost March or Charizard because it loses to Malamar, and those who aren’t afraid will generally not do well since they’ll most likely run into a couple of them. However, a bad Stall matchup isn’t such a deterrent. Individual players may be afraid to run, say, Zapdos / Ultra Beasts because of Stall, but Stall isn’t popular enough to stop Zapdos / Ultra Beasts as a whole from doing well. “I autolose to Stall, but I can just hope to dodge it” is a reasonable thought going into a Regionals; replace Stall by Malamar, and it isn’t. Or, should I say, wasn’t. Malamar is not the “boogieman” it once was. I’ve been over the causes already: bad matchups against Zapdos / Jirachi and Pikachu & Zekrom-GX right as they have reached their apex in strength and popularity. In any case, Malamar hasn’t been putting results despite being one of the most popular decks in the format. Looking at the seven Standard Regionals and Special Events since Team Up’s release that had over 100 players, only one Malamar deck has made Top 8 — in Collinsville, back in February. Collinsville Regionals, February 23rd: 200 Malamar decks out of 1056 players (19.0%). 99 players made day two, including 14 Malamar decks (14.1%). Conversion rate: 7.0% of Malamar decks made day two (compared to 9.4% of all players). Fortaleza Regionals, March 23rd: 35 Malamar decks out of 233 players (15.0%). 32 players made day two, including 2 Malamar decks (6.3%). Conversion rate: 5.7% of Malamar decks made day two (compared to 13.7% of all players). Denver, April 6th: 61 Malamar decks out of 640 players (9.5%). 52** players known that made day two, including 2** Malamar decks (3.8%). Conversion rate: 3.2% of Malamar decks made day two (compared to 8.1% of all players). * There may be some inaccuracies due to possible Malamar decks being classified as “Other”. Nevertheless, this shouldn’t change the conclusions. ** There were 60 players in day 2 in Denver, but at the time of writing, only 52 of these decks were known. The conclusion is clear: things are looking grim for Malamar in all regards. Its play rate is getting worse, in day one and day two. Its day two conversion rate is below the general conversion rate, which means that Malamar players get into day two at a lower rate than those using other decks. The conversion rate is also getting worse. Even the speed at which these rates are getting worse is itself getting worse! To put it another way, Malamar’s decline is accelerating. The deck is, basically, in free fall. Playing Malamar is riskier than ever. And this, in turn, means that there’s no better time to play a deck that’s weak to Malamar.